Christmas 2017: Families at Seton Center and Saint Louis Parish will be accepting donations of food for the family and gifts for children 16 years and under. New toys and gifts can be left in the Narthex from November 11 – December 3. Please bring food items the weekend of December 2-3. 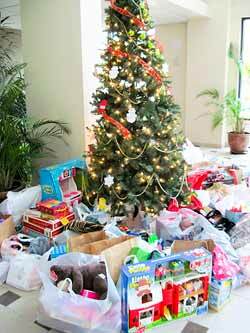 Buy a new toys or gifts to leave by the tree in the Narthex. The tree has ornaments with gift suggestions. Gifts can be left (unwrapped) anytime between November 14 and December 6. Most of those individual gifts will be taken to Saint Louis Parish. Shop for a specific child or children (age 16 and under) from Seton Center. You would be given the wish list and sizes for each child. This is generally a cost of $75-$100 per child. To “adopt” one or more children, please contact Rita at tiehenr@gmail.com, or 913-244-1581. This is a great family or group project! If your family, friends, club or company would like to adopt children to shop for, please contact Rita Tiehen. A Christmas tree with gift idea ornaments will be in the Narthex starting November 11. Please take one or several tags and shop for those gifts. Gifts may be left in the Narthex (unwrapped!) and we will culminate with the big food and gift drive on December 2 & 3 in More Hall. Saint Louis Parish really needs help preparing their Christmas items the week of December 3th. If you are able to help, please contact Beverly at 816-822-9091. With your generosity we will be able to help many struggling families provide a happy Christmas for their children!